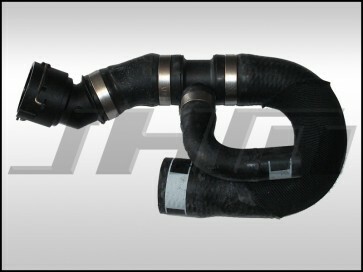 This is a brand new, OEM Lower Radiator Hose for your B6-S4. This is the main hose on the driver's side of the car that connects to the bottom of the radiator (with a quick coupling or disconnect piece), to the water pump, and to a check valve (that's attached to a hose leading to the driver side auxiliary radiator). NOTE ON FITMENT: For B6-S4s, there were two different versions of this lower radiator hose. On EARLY versions of this hose, the small 90 degree rubber hose that comes off the T connection and goes to the check valve before the hose that attaches to the the driver side auxiliary radiator will have a uniform size and have an outlet of 20mm where it connects to the check valve. The LATE versions of this hose will have a small 90 degree hose that has a "step-up" in it that goes from smaller at the T connection to a larger diameter of 25mm at the check valve connection. This is the EARLY hose with the 20mm check valve connection. Most B6-S4s with VINs less than or up 8E-5-023000 will have THIS HOSE. Most cars with a VIN greater than or after 8E-5-023001 will have a different version of this part (which we also sell). Audi does not list this split as being definitive so it's possible that you may have a hose different than the one identified by your VIN. The best thing to do is to look at the part number from the hose on your car. If you have a hose on your car with a part number of 8E0121055L (or sometimes 8E0 121 055 L) you have an EARLY hose. Add this hose to your cart and proceed to checkout. If you have a hose on your car with a part number of 8E0121055AD (or 8E0 121 055 AD) you have a LATE hose. Go back one section, select that hose, ad it to your cart, and proceed to checkout. Don't forget to add coolant to your order!